Romantic Getaway (Pocatello, Idaho) – Discover how I created an exotic romantic getaway for less in Pocatello, Idaho. No plane tickets or expensive itinerary, just loads of fun and love. Includes reviews of the Museum of Clean, Buddy’s Italian Restaurant, Olivers Restaurant, and the Black Swan Inn. Do you have an upcoming special occasion, birthday, anniversary or just want to reconnect with your significant other without spending a small fortune or buying a plane ticket? If you live in Idaho or the surrounding areas and are looking for an inexpensive romantic getaway alternative, you NEED to read this! I’m sharing my ideas on making a fabulous weekend for you and your significant other without breaking the bank. Let me just start this post by saying, here at Kitchen Cents, I focus on inexpensive delicious, easy recipes your family will love. Where is this travel post coming from? To be frank, it’s coming from out of the blue. I’m toying with the idea of branching out into Food & Travels. I’m hoping this will be the first of many to come. Or maybe we’ll just start a sister blog… travelercents.com! It does have a nice ring to it, doesn’t it? I thought today would be a perfect day to share my experiences of this awesome weekend because… it’s my 9th wedding anniversary! Yay us! 9 years! PHEW!!! 9 years, 4 kids, 3 companies, 5 moves, great laughs, hard tears, and a whole bunch of love later and here we are. A lot has happened in the past 9 years, and getaways like this romantic one I’m sharing with you help us rejuvenate and reconnect. Recently, Ryan and I decided we wanted needed a kid-free weekend. I began scouring the internet for the best romantic destinations within a few hours drive of where we currently live (Provo, UT). Several came up including places in Heber, Park City, Salt Lake City but nothing was sparking my interest. After talking to Ryan, we decided to head toward Lava Hot Springs, a memorable hot spring for both of us. There’s nothing like a late-night soak at a steamy hot spring to bring on the reconnection and romantic sparks. 😉 Right? I began researching accommodations around and near Lava. Most hotels were $100 to $200 dollars with some being $250 to $350 a night. That was for a regular hotel room. I wanted this weekend to be special. Not just a weekend at a rinky-dink average place—something special. It would be the first weekend in a LONG time we had together just the two of us, no kids, no agenda, just us. HAVE YOU EVER STAYED AT A HOTEL/INN WITH THEMED ROOMS? Until that weekend, I’d never stayed at an Inn with romantic themed rooms. We found a room at the Black Swan Inn in Pocatello, ID. Check them out for yourself here! They also have a 2nd sister property in Idaho Falls called Destinations Inn where the rooms are themed from famous popular destinations all over the world. I hope Ryan and I get a chance to check out that property sometime soon. It looks just as beautiful as the Black Swan Inn. 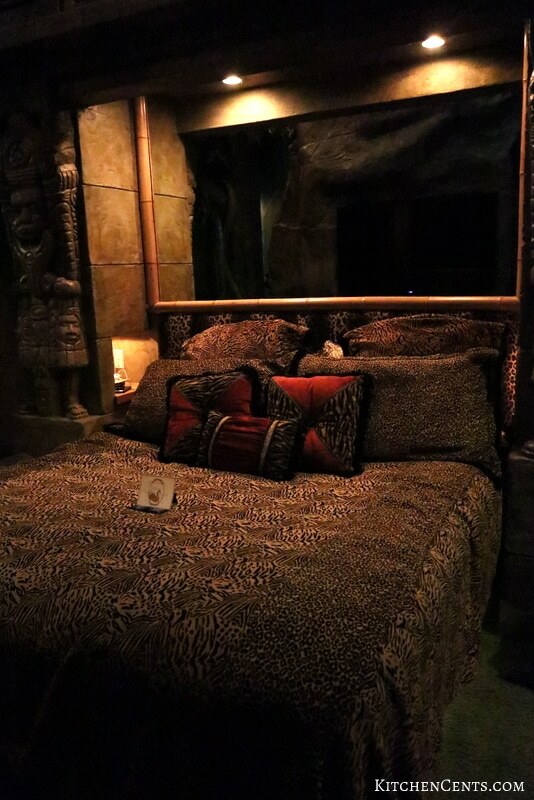 NOTE: THE PICTURES ONLINE DO NOT DO THESE ROOMS JUSTICE. From the pictures online, I was skeptical and wondered if I would regret staying here over a regular hotel that might be a little cheaper (might not). Boy, was I surprised! Let me be the first to say, I was pleasantly surprised at the quality, craftsmanship, and atmosphere in the rooms at the Black Swan Inn. From the moment we walked into our very fresh, clean smelling room, to the AMAZING artwork covering the ENTIRE room, to the sculpture work, to the chocolates and a personalized welcome card waiting atop the bed, this place is phenomenal. We stayed in their Mayan room where a canopy of trees and artificial branches with leaves covered our bed, and a two-person tub awaited in an elegant tree loft above. 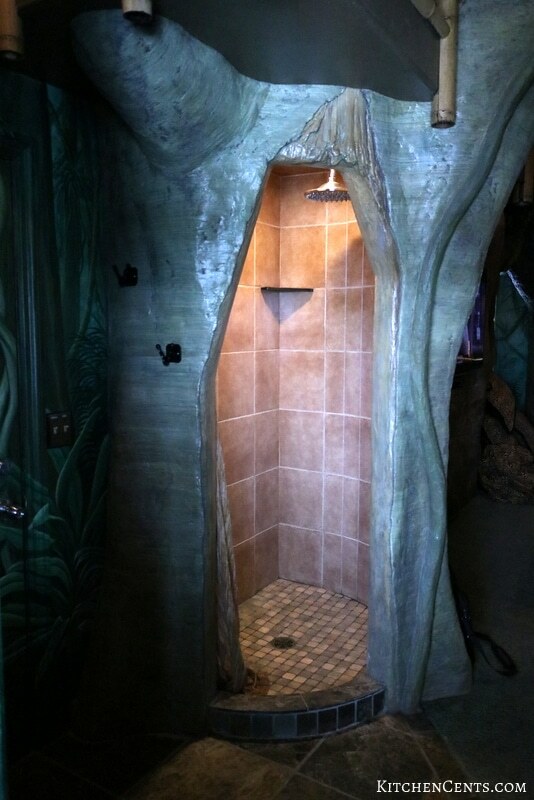 We also had a conveniently located shower in our room built into the trunk of a tree. The attention to detail in this place was insane! The lighting was the biggest surprise. With the pictures of their rooms I’d browsed online the lighting appeared to be bright (so the detail of the room stands out) but when we walked into our room, and others we were able to tour, the mood was instantly set by the lighting and romantic music playing on the very large television. It was truly amazing, romantic, and something I think every couple, newlywed or married-for-decades, should experience every once in a while. We enjoyed their later-than-normal (12 noon) checkout time as we lazed about, enjoying breakfast and watching a movie in the jetted tub designed for two. Another reason why I loved the idea of staying at a place like the Black Swan Inn or another luxury romantic themed suites is for the convenience of travel time. If we were okay to spend oodles of money on an exotic romantic getaway, we would have to spend hours at the airport, fly to our destination, find transportation, etc. Finding a diamond in the rough like this place lessens travel time and increases the time we have for each other. I love that! It’s like a stay-cation vs vacation. When you only have a couple of days to get away, don’t waste half the time and cost of your getaway by traveling far to your destination. We were able to meet the owner, Larry, who gave us a brief history of the Black Swan Inn. He and his wife acquired the property in 1996 as an apartment building. Over the first year of owning the property, they began renovations to create their first wing of themed rooms. They officially opened in 1997. Over the next few years, they continued to move from room to room, completing one every 6 weeks or so. They now have 15 theme rooms completed at the Black Swan Inn with room to expand to 19 rooms if they so wish in the future. I was able to tour over half the rooms and all have been meticulously detailed to perfection. Larry’s wife, Debbie, has completed over 80% of the paintings and murals in the rooms at Black Swan Inn. Her work is fantastic! YOU MIGHT BE CURIOUS ABOUT THE PRICE OF STAYING IN ONE OF THESE AMAZING ROOMS, RIGHT? Prices for a room at the Black Swan Inn range from $99 to $239 a night depending on what days you stay. That’s about what you’ll pay for a regular rinky-dink hotel room, no special features, amazing artwork, romantic lighting or mood added. Here’s the kicker… The Black Swan Inn has been offering an offset weekend special. You can check out their current specials here. If you stay in the same suite both, Saturday AND Sunday night, Sunday night’s stay is discounted 50%. Woot, WOOT! 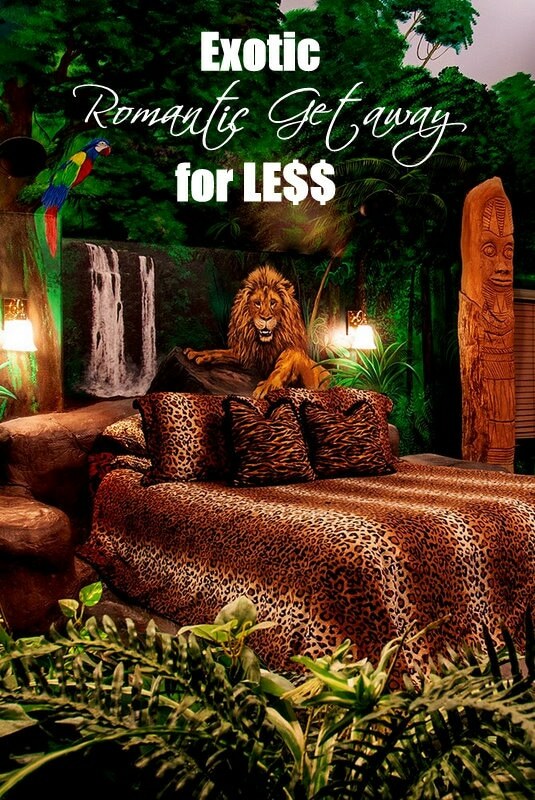 Now, we’re talking luxury romantic theme rooms for rinky-dink hotel room prices! If you’re still skeptical about staying at a place like the Black Swan Inn and are in the neighborhood, give them a call. I’m sure they’d be happy to show you around and I’m pretty sure you won’t be disappointed—we absolutely weren’t! 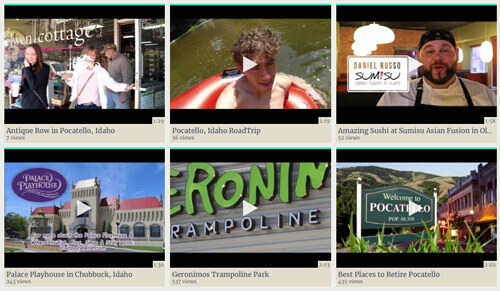 WHAT TO DO IN POCATELLO, ID? Palace Playhouse (also known as Mystique Theater) – this is a theater that offers dinner and a quality show. You can check out the current or upcoming shows here. Tickets range from $10-18 per person for the show only or $30-42 depending on what dinner choice you choose. There wasn’t a show playing during our trip but we received high recommendations from several locals to check this place out. Church Chapels – there are a couple of chapels in the area that have exquisite structural and architectural details. These are the St. Joseph’s Chapel and Trinity Episcopal Church. Museums – if you’re a museum-goer there are several museums right in or around Pocatello. These include the Museum of Clean ($6 per person), Idaho Museum of Natural History (Closed Mondays, $7 per person), Fort Hall Replica ($5-6 per person depending on the time of year), and the Shoshone-Banncock Tribe Museum (small admission fee). Lava Hot Springs – Lava is about a 40-minute drive from Pocatello. It’s a natural hot spring with water temperatures ranging from 102°-110° year around. This is a fantastic place to go soak your cares away and relax together. Admission into the hot soaker pools ranges from $6-10 depending on the time of year and day you go. In the summer months, floating the little local river is a blast or simply enjoy large swimming pools at the outdoor aquatic center. When we arrived in Pocatello, we were earlier than expected. We had a couple of hours to kill before checking into our room at the Black Swan Inn. We decided to do a quick google search for things to do in the area. The Museum of Clean was at the top of the list with fairly high reviews. Without the chaos of our little girls (4 of them, 6 years old and under) we chose to heed the opportunity and check out the Museum of Clean. When we arrived at the building it is located in, we were surprised. It is one of the tallest, newest buildings in the area.